Louisa Cook Moats, Ed.D., is President, Moats Associates Consulting, Inc., Hailey, Idaho. A necessary resource for all who are involved with language instruction of any kind. I rented this textbook from ecampus because I teach reading and it was very informative and helpful. It presents the structure of the English language in a readable and knowledgeable format. I found this book enjoyable and easy to read, yet packed with interesting and relevant information. Highly recommended as a beginning text on the phonetics, phonology, morphology and orthography of the English language. 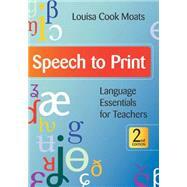 Speech to Print, 2e : Language Essentials for Teachers, Second Edition: 5 out of 5 stars based on 1 user reviews.